One of my all-time favorite episodes of the Simpson’s is about St. Patrick’s Day. The whole town of Springfield gets drunk and stupid. More so than usual. Everyone is stumbling, puking and fighting. Even the police. Especially the police. And all of them are wearing that dumbass shade of green. Only when Bart accidentally gets drunk does Springfield’s citizenry show any concern. When it comes to drinking, St. Patrick’s Day rivals New Year’s Eve for “amateur night.” I’d argue that given my hometown, Chicago’s ‘proud’ Irish heritage March 17th is actually bigger and dumber than Dec 31st. 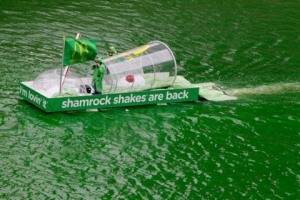 We dye the river green! For me, the mandatory drinking that the “holiday” requires is annoying. As is the mob scene. By 7 PM, North Clark Street resembles Bourbon Street during Mardi Gras. Rush Street is even worse. Before you take me for a Puritan, you should know for many years alcohol was one of my best friends. We went to high school together. In college, I graduated from beer to vodka. Like playing “Quarters,” beer just seemed silly. Plus it took too long to get drunk. 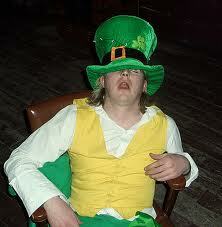 I took drinking far too seriously to be caught dead in some Irish bar on St. Patrick’s Day. Granted, I took drinking far too seriously period but that’s another story. Anyway, I’m not a fan. That said here’s a clever piece of outdoor advertising from McDonald’s and Leo Burnett. Cheers! When it comes to creativity, many of the biggest ideas defied process.